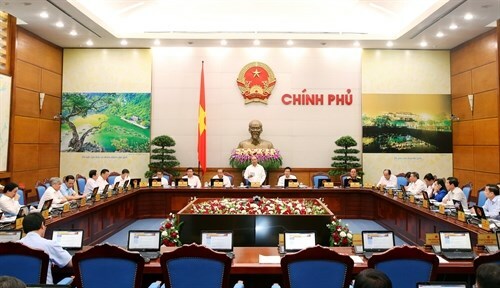 Hanoi (VNA) – Prime Minister Nguyen Xuan Phuc requested all-out efforts to achieve 6.3-6.5 percent growth this year during a monthly Government meeting in Hanoi on October 3. To that end, the growth for the fourth quarter of this year must be 7.1-7.3 percent – a high figure but it is achievable, he said. He asked ministries and agencies to review shortcomings and impacts of policies on the socio-economic performance, take note of social and environment goals, not only for 2016, 2017 but also for 2016-2021. Commenting on the socio-economic performance for nine months of this year, the PM hailed the macro-economic stability, low inflation and quarter-on-quarter economic growth which hit 6.4 percent in the third quarter, the highest in the year. He expressed his delight at the increase in foreign indirect investment in September, including those from Vinacapital and Indochina. The securities market achieved a record growth over the past nine months. On October 3, Japan’s Nikkei financial review released the Manufacturing Purchasing Managers’ Index (PMI) for September. Vietnam’s PMI rose to a 16-month high of 52.9, higher than China and Japan (50.4), Indonesia (50.9), Thailand (48.8), and ASEAN (50.5). During the period, as many as 91,000 new firms were established. Overseas remittances kept flowing in high volume, especially in manufacturing sector. The farming sector saw strong growth in the exports of shrimp and livestock. As of the third quarter of this year, the sector grew 0.65 percent compared to the minus 0.18 percent in the first half. The PM praised Vietnam for taking the top position at the fifth Asian Beach Games with 139 medals, including 52 golds, as well as positive results in the fields of education-training, environment, national defence-security, and external affairs. In mechanism building, the government has submitted four key projects on national development for 2017 and the next years to the Party Central Committee, the revised laws on anti-corruption and the development of small and medium-sized enterprises to the National Assembly Standing Committee. The government also has also issued four documents guiding the implementation of the National Target Programme on New Rural Construction. In recovery from the mass fish death in the central coastal region, the government has earmarked 3 trillion VND (136.3 million USD) for victims and is directing to offer more support to them, he said. During the meeting, the Cabinet gave their feedback on the revised Law on technology transfer, the draft Decree on amending several articles of the Decree on e-transaction in financial activities, the draft proposal on the issuance of a Decree on piloting e-visa for foreigners. The government is due to continue discussing the socio-economic development on October 4./.